Visibly Clear® Blackhead Eliminating Daily Scrub. 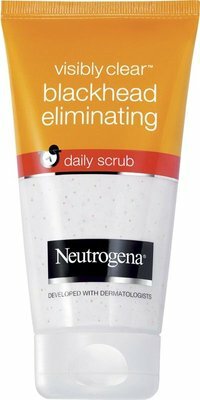 Helps eliminate existing blackheads: the creamy scrub with exfoliating micro-beads unclogs pores to remove trapped oil and dirt. the source of blackheads. For less visible pores: the scrub purifies the skin and cleanses deep into the pores. Used daily. pores appear reduced. Helps eliminate blackheads from day 1. for less visible pores. Developed with dermatologists. UseInstructions: Directions for use: recommended for daily usage. Apply on wet face. Gently massage. especially on blackhead prone areas. Rinse thoroughly.